Coinciding with his current solo exhibition at Doggerfisher in Edinburgh Conversations with Nathan Coley on August 11th delivered a rare opportunity to hear the artist speak about his latest work. For the uninitiated the show clearly displays the scope of the artist's work in what Coley described as "a tasting menu of my practice". In denial of meaning the artist's presence in the gallery walking and talking his way through the space did nothing to dilute the complexity of the work and satisfyingly raised many more questions than it answered. Coley's works are not about absolute statements of truth or beauty but are primarily intellectual propositions for the audience to tease out on their own. The "generation of discussion is the centre of the work rather than the object". Art for Coley is a "trade in ideas", "if it were just beautiful that would be dangerous". The exhibition itself does not disappoint. Coley is an artist that creates a compelling dialogue within pieces but also between them, a defining characteristic of a series of works created at Mount Stuart for which the artist has been short listed for the Turner Prize 2007. On entering the space and crossing the threshold of installed oak the viewer is confronted by a barricade, the human scale of the construction allowing the spectator to see through to the space beyond. An evolution of the camouflage pattern painted on the walls of Mount Stuart's contemporary gallery and on the models "Camouflage Church", Camouflage Synagogue" and Camouflage Mosque" made during the artist's residency on the Isle of Bute can be now seen as actual form. The recurrent camouflage motif functions here in three dimensions as a barricade, sculpture and architectural division rather than referring to an optical illusion or historical defensive device as in previous work. The pattern as sculpture rises up from the floor at odd angles in a way that is unsettling, creating unease about the stability of the floor you typically take for granted, particularly in a gallery space as smooth, sanctioned and level. This first piece epitomises the artist's attitude towards belief, about the gallery space we are entering and our own foundations of thought which are made manifest in a built environment. 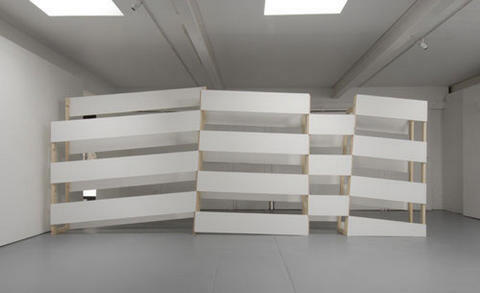 The untitled barricade sculpture functions as an "invisible filter", an intellectual proposition that could be adapted for any space, even though here it was created specifically for the site. It is interesting to hear the artist speak of his concern with materials both in "Untitled (Threshold Sculpture)" and Untitled (Barricade Sculpture)". The spiritual connotation of oak and it's the moral and structural integrity by association permeates the work and also frames a series of five adjacent works. Though Coley resists the idea of meaning in his work here it is difficult to separate from creative intent or process. Use of oak has historical and religious resonance and has been chosen quite deliberately by the artist. It is durable and has longevity as a material. It is not only the idea but the physical aspect of these pieces which convey meaning even though the artist states that meaning is of no concern to him. What makes viewing Coley's work so engaging is precisely this self reflexive quality, stimulating unease, demanding a process of thought and an examination of one's own beliefs and assumptions whether political, religious or social. Illuminated text features as another recurrent motif in the artist's practice, in this instance a single word "HERE" above eye height guiding the viewer past the barricade and deeper into the space. Like the phases used in the new light piece "We Must Cultivate Our Garden" on the rooftop of 9-10 St Andrews Square in Edinburgh (2007) or the installation at Mount Stuart "There Will Be No Miracles Here" (2006) there is an ironic sense of proclamation and authority in the artist's use of text. Use of appropriated text illuminated and displayed in different context plays with the idea of power, authority and authorship, resisting declarations of truth and creating ambiguity through location. Through the associations of preaching moral obligation or as an enforcement of law these illuminated signs operate rather like the barricade filter, we can only deduce our own meanings from the visual stimulus of light and text. The true context of the statement is removed so we must create our own truth. The power of thought, perception and the ability to affect change rests with the individual rather than with traditional institutions or proclamations issued by church or state. "Secular Icon in an Age of Moral Uncertainty", a rectangular panel of fairground lights reduces the motif of illuminated text to pattern. Visually it bears an interesting relationship to a sequence of five adjacent pieces "Annihilated Confessions", three white and two black. The illumination of the "Secular icon" allows a natural frame to emerge much like the borders of Coley's appropriated black and white photographs of ornate confessional boxes, the middle section of each obliterated by a rectangle of spray paint. The white and black rectangular paintwork recalls the work of the Colourfield Abstract Expressionist painters such as Rothko or Reinhardt. The outer frame of light allows the garish panel of lights to hover out from the wall much like the spray paint on glass in the confessional box images in a modern inversion of faith. These lights say nothing but draw our gaze like a fairground attraction. Presented in this way and with echoes of Rothko they too seem to allude to an ironic modern state of spirituality. Linked to the threshold sculpture the series "Annihilated confessions" are also representations of spaces defined by belief. With our expectation of the main subject obliterated the audience has to imagine the rest of images which are effectively screened by the artist. There is a play between the surface illusion of the photographic image, the glass containing something precious, presenting this to the viewer and the artist's hand or spray can as the final layer. As with all Coley's work each element works in counterpoint with another, within individual pieces and also between works occupying the same space. Situated in the confines of an adjacent room "Safe House" recalls the construction methods of "The Lamp of Sacrifice, 286 Places of Worship, Edinburgh" (2004) and the Mount Stuart scale models. Here the combination of text is set diametrically opposite the naïve ready made hard board and timber construction. The text, isolated words cut into double layered architectural facades; Wealth, Land, Life, Mind and Belief were revealed by the artist during discussion as a reference to "the five rights of man under Islamic law". The artist poses the question; "Do we really have the right to wealth or land?" and sanctioned by who? Coley's previous solo show at Haunch of Venison in London (2005) presented a series of images of contemporary show homes as examples of the manifestation of belief about status, power and lifestyle in a built environment. Made following the Glasgow airport incident earlier this year the "Safe House" makes reference to the global implications of the object, conflict through religion and the ideological construct of our own four walls. Although the piece may have drawn inspiration from recent events the context of "safe house" has broader implications and reveals a central preoccupation in the artist's practice with "physical and social notions of public space". Coley's issue is with all sytems of religious, political or social control, stimulating debate about our relationship between the built environment and ideology. His ambition for "ideas and ideas made manifest" remains the driving force of his work.